Athletes could be falsely accused of cheating if blood data is not analysed correctly, the head of UK Anti-Doping (Ukad) has warned. 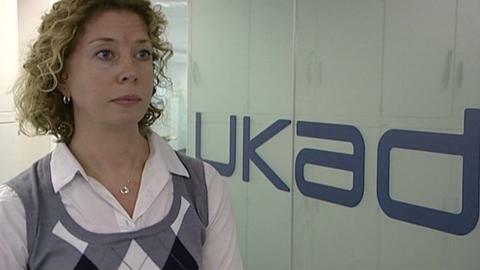 But Ukad chief executive Nicole Sapstead says other factors must be taken into account to ensure accuracy. "You can't just look at anonymous data in isolation. You have to look at it in context," she told BBC Radio 5 live. "You have to look at whether that data was collected when an athlete was at altitude, after they competed, after they were training, whether they had a medical condition that might justify some of those results. "This data, without a narrative behind it, can be misinterpreted. "Let's say we have an athlete whose data shows a strange fluctuation at some point in their testing history. Then they have to go through the ordeal of explaining why there was a blip on their profile. "It continues to draw speculation and inferences where there doesn't need to be any. "I don't think any athlete should be put in the position where they feel the need to stop the public from suspecting them." Ukad is the latest organisation to comment on the doping allegations following a week that has brought the integrity of athletics into question. The Sunday Times and German broadcaster ARD/WDR obtained leaked International Association of Athletics Federations (IAAF) files containing the results of 12,000 blood tests from 5,000 athletes between 2001 and 2012, which the newspaper published on 2 August. They used two of the world's "foremost anti-doping experts", scientists Robin Parisotto and Michael Ashenden, to review the data, which the paper says reveals the "extraordinary extent of cheating" by athletes at the world's biggest events. Among the allegations was that a third of medals (146, including 55 golds) in endurance events at the Olympics and World Championships between 2001 and 2012 were won by athletes who have recorded suspicious tests. Also, more than 800 athletes - one in seven of those named in the files - have recorded blood tests described by one of the experts as "highly suggestive of doping or at the very least abnormal" and a top UK athlete is among seven Britons with suspicious blood scores. The World Anti-Doping Agency's independent commission quickly announced it would investigate the claims made by the Sunday Times and the ARD/WDR documentary Doping - Top Secret: The Shadowy World of Athletics. On the subject of the Wada investigation, Sapstead said: "I am very encouraged by the fact the World Anti-doping Agency is running an independent investigation on this and I can only hope at the end of that - which I believe is the end of the year - we can all be a bit more comfortable about the state of some of the sports out there." In a statement, the IAAF described allegations of widespread doping in athletics as "sensationalist and confusing". Athletics' world governing body stressed the results were not positive tests or proof of doping and also rejected the suggestion it had done nothing to act upon data showing "suspicious" results. The IAAF would go on to criticise the scientists involved in the investigation, stating on 8 August that "they do not have access to IAAF testing records and are therefore not able to know if proper testing follow-up was conducted". Britain's Lord Coe, who has made independent testing a key part of his campaign to be elected as the new president of the IAAF this month, described the allegations of widespread doping in athletics as a "declaration of war" and says it is time to "come out fighting" to protect the sport's reputation. "The fightback has to start here," Coe, an IAAF vice-president, told BBC Radio 4 on 5 August. Sergey Bubka, Coe's rival for the position of president, said even more transparency in the organisation is needed to aid the fight against doping. The Sunday Times responded with a statement standing by its story and accusing the IAAF of being "disingenuous" by dismissing it as sensationalist after spending "just two days conducting what it describes as a 'thorough' investigation". The Sunday Times continued with its allegations, claiming on 9 August that the London Marathon was won seven times in 12 years by athletes who have recorded suspicious blood scores. Based on "an expert analysis", the newspaper also claimed the winners of 34 major city marathons - one in four - "should have faced censure or at least been investigated over evidence of potential blood doping within their test results". This came two days after Russian Liliya Shobukhova, who won the London Marathon in 2010 and was runner-up in 2011, had her results since 2009 annulled for doping. Double Olympic gold medallist Mo Farah is one of eight British athletes who have agreed to some details of their anti-doping blood tests being made public in an attempt to prove they are clean. The 32-year-old, who recorded no abnormal tests, has repeatedly insisted on his innocence after his coach Alberto Salazar was accused at being of the centre of doping allegations, according to a BBC investigation. Salazar also denies any wrongdoing. On the subject of British athletes, Sapstead said: "UK Anti-Doping runs a comprehensive programme on British athletes. They are subject to the type of scrutiny not many athletes are subject to around the world. "We do that through education, through testing, through using intelligence to inform on testing programs and by analysing our samples for a multitude of substances, including putting some athletes through the biological passport. "What I can say is that the public should have confidence that there is an organisation within the UK that is targeting and properly focusing on the athletes that they think might be doping and also giving the public reassurance that all the athletes that it does test are by and large clean." An Athlete Biological Passport is an electronic document about the athlete that contains certain biomarkers from through his career. If these markers change dramatically it alerts officials that the athlete might be doping. On Monday, a group of athletes led by Germany's Olympic discus champion Robert Harting released a YouTube video claiming the IAAF was not doing enough to fight doping. In the video, the athletes held up messages, with one reading "I want to run against clean athletes, not monsters". In response, the IAAF invited Harting to its offices to see how it is "rooting out the cheats and protecting the credibility of competition". It added that it "greatly admires" Harting's "no-nonsense anti-doping stance".